Boy Scout backpacking reinforces Physical Fitness, Mental Awareness, Leadership, and Outdoor Skills. Scout backpacking also provides an opportunity for life-changing experiences. Scout Backpacking fosters camaraderie and leadership – not just from the hike, but also because of all the time the boys spend together getting ready for the actual expedition. A totally complete Scout Backpacking Manual with pictures and practical information can be found by scrolling down. Backpacking can cost a lot of money and to make things worse, you have to spend money even before you take your first hike, in other words even before you know if you like backpacking. Most experienced backpackers recommend that you buy the best equipment possible from the very beginning. Here are some blogs about buying equipment to get you started. Ultralight Backpacking may be the biggest change to hit Scout backpacking since the development of the hip strap. While still slightly controversial, it is increasingly accepted as a viable alternative to carrying the entire backpack and equipment list described in the Basic Backpacking Awareness course. UltraLight Backpacking promotes the idea that a hiker can lower their pack weight by purchasing newer and lighter equipment, eliminating potentially unnecessary items, sharing equipment among the group, and using items for multiple purposes. Its not unusual for an advocate to get their weight from the standard 40-45 lbs to as low as 15 pounds by carefully weighing each item and continually seeking improvement. Their goal is to maintain the same level of comfort and safety at a significantly lower pack weight. It’s easy to see why many units are moving in this direction. Some Scout leaders have not yet totally embraced the concept because it means that the margin for error is reduced and the risk of encountering problems might be higher. Problems are created when traditional (heavy) equipment is integrated with an Ultralight system. For example, you can’t, in an emergency, ask a hiker with an Ultralight pack to carry a heavy tent or sleeping bag that belongs to someone who is not also Ultralight. There is also an argument over footwear. Ultralight footwear is more like tennis shoes than boots, built for speed but not ankle support. Many Scout leaders think that teenage boys need the support of regular boots to protect against sprains. The wilderness is getting crowded. And large groups of backpacking Scouts have a special responsibility to set an example while on the trail. We have evolved 180 degrees from the days of Daniel Beard , when boys were taught how to live off the land, partly in rebellion against modern technology that was polluting urban environments. Today, Boy Scouts of America, in conjunction with the Forestry Service, National Outdoor Leadership School, and a large number of environmental organizations are cooperating to promote “Leave No Trace” as a philosophy for everyone who ventures into the back country. For more information about BSA’s Leave No Trace Program, click here. So the next time you get annoyed by the strict rules at Philmont or get angry at the Ranger writing your group a ticket for having a fire without a permit, just remember that they are doing the small things they can to help preserve the wilderness experience for your grandson. The Outdoor Code and Leave No Trace are not just annoying exercises on the path to Tenderfoot – it is as important to Scouting’s future as the Oath and Law have been to Scouting’s past. Request your own free PDF copy. “Backpacking for Boys” contains Checklists, “Trail Tips”, pictures and useful references for a fun (and safe) wilderness backpacking adventure. Topics include trail leadership, physical conditioning, planning the hike, what to pack, how to buy equipment, taking care of your feet, navigation, wilderness first aid, setting up a campsite, and ideas for fine dining at any altitude. Please send a copy of the Backpacking for Boys. Please sent a copy of the Backpacking for boys. This is a great website – very helpful. I’d love a copy of the “Backpacking for Boys” PDF. Thanks. I’d like a copy of the “Backpacking for Boys” PDF for my scout taking his first backpacking trip. Thank you! please share the PDF packing list for scouts. Thanks for the advice at the Dublin REI Store last Friday. I’d like a copy of the “Backpacking for Boys” PDF. Troop 11 in Mt Pleasant, SC will hike 50 miles this December. Would you please share a copy of “backpacking for boys” with our Troop? I would like to request a copy of your backpacking for boys guide – Thanks for all the great information you have posted on your site. I am an Assistant Scoutmaster with our troop in North Carolina and plan to take our youngest patrol 11-12 years old on their first backpacking hike. I would like to get a copy of Backpacking for Boys, if you would share. 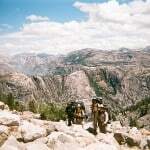 Its not unusual for a Troop in our area of Northern California to complete more than 150 miles of backpacking every summer. Maybe it’s because we are blessed with such beautiful trails and wilderness areas. 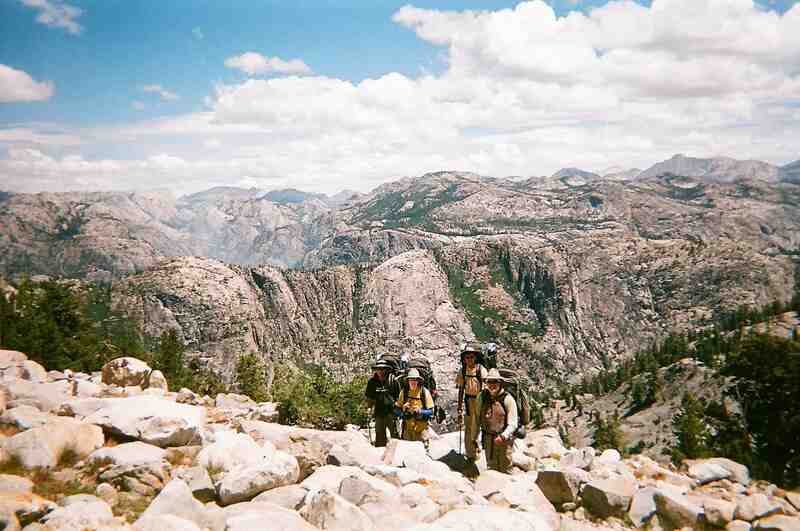 Even as a boy in Southern California, backpacking was a common monthly activity for all the Troops. I am wondering if Units in other parts of the country spend as much time on the trail? And whether enthusiasm for backpacking is as high now as 10 years ago. I am presently building a trail guide depicting the main trails between Lake Tahoe and Mount Whitney, including the Tahoe to Yosemite routes, the Pacific Crest Trail route, the John Muir Trail, and a whole lot of route options along the way. In July of 2009, I met four Boy Scout expert backpackers setting up hikes for Scouts heading up to the Wolfeboro Camp near Bear Valley. I was doing the Tahoe to Yosemite route, (on my way to Mount Whitney) about to pass through the Silver Trailhead at the East side of Lake Alpine. This will be followed by a related entry on the backpacker’s forum, as I catch up! This is currently a trail guide in progress…If you guys have any links to promote the Boy Scouts or the Wolfeboro Treckers, let me know and I will post them with my Boy Scout encounters along the High Sierra Trails. I try to walk the whole route every Summer, so I run into Scouts on a regular basis. Most of you guys are squared-away backpackers.